Today we had a great lesson with using circuits. Having just learned the symbols and how to create circuit diagrams, we moved onto circuit construction with series and parallel circuits. 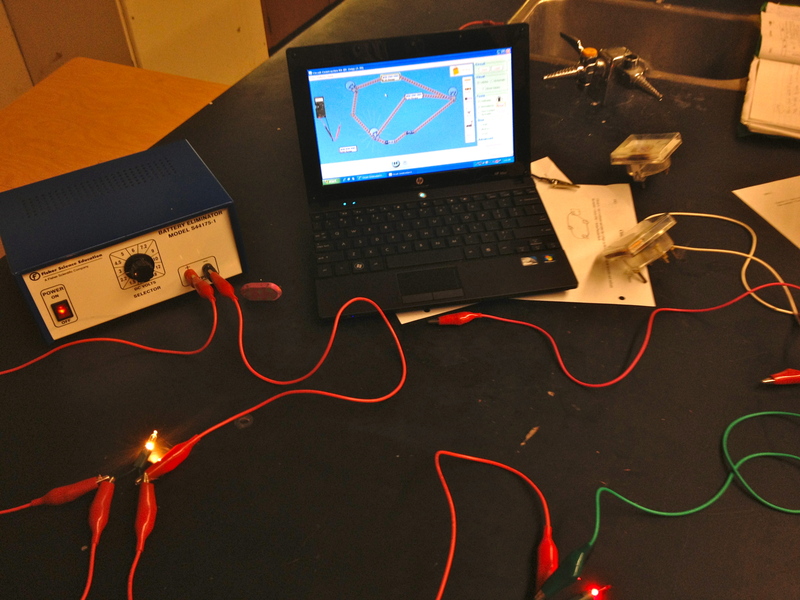 One of the best free resources out there for electricity comes from University of Colorado, PhET (phet.colorado.edu) using the circuit construction kit the students were able to make their drawings into online circuits, then use the equipment to make the physical circuit. Having the mobile cart of netbooks was a great addition to this lab. We were able to bring a laptop to each work station and have students connect the diagrams, simulations and physical circuits. The students were incredibly engaged and started testing out their own circuit ideas. This allowed another level as well as a chance to practice computer skills. It is also beneficial, as many companies will use simulations to test before making costly prototypes. The lesson started out with learning the basics and having students build simple series and parallel circuits, but quickly turned into challenges and problems that students needed to use their knowledge and critical thinking skills to solved. Students were told they were hired by a brand new game show that required contestants to flip switches to light up their answers. They had to figure out how to wire it, test it as a simulation and then physically build it. Netbooks/Laptops have been an amazing part of my science lessons as it gives students an opportunity to become more engaged in science. It is preparing them to meet the needs of higher education and employers who use technology with science hand in hand.